Did you know that the French breed of chicken called the Marans (named after the French town Marans where they originated) lays some of the darkest brown eggs of any breed? 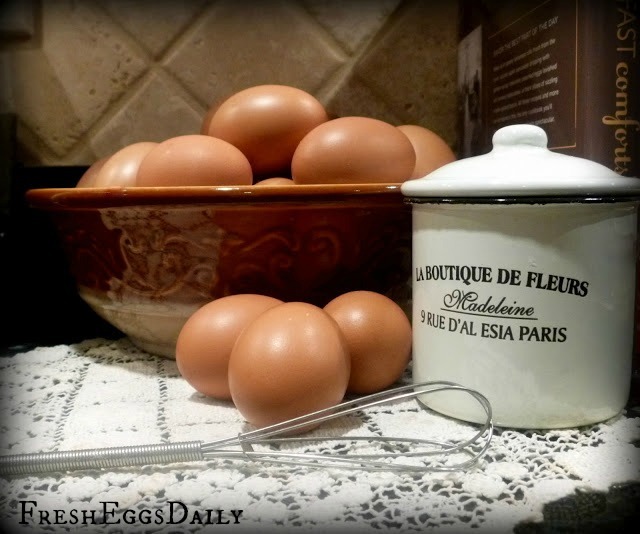 Did you know that some French chefs will ONLY cook with Marans eggs, claiming they are superior in taste and quality? 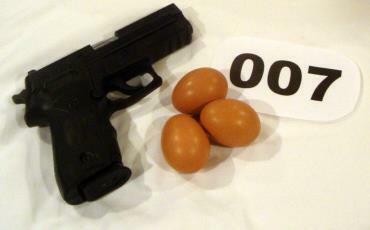 Did you know that the fictional character James Bond requested a Marans egg for breakfast each morning in the series of books written by Ian Fleming? 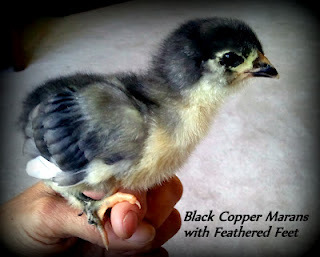 Did you know that Marans come in several colors including Black Copper, Blue Copper, White, Wheaten and Splash varieties? 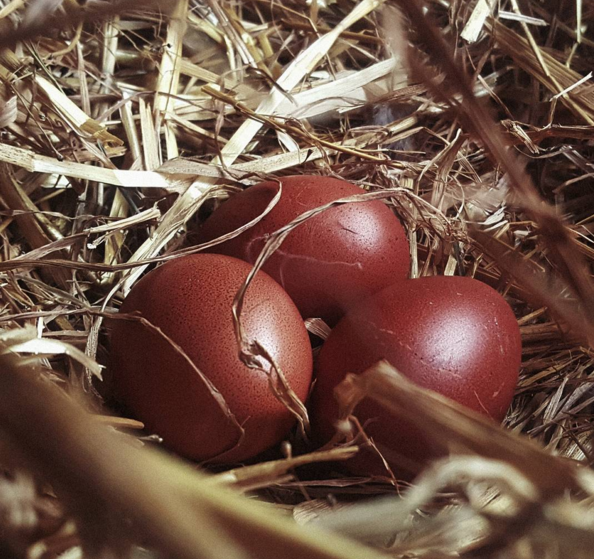 Did you know that Marans eggshells have smaller pores than the shells of other breeds, making them far less likely to contain salmonella and allowing the Marans eggs to stay fresher longer? 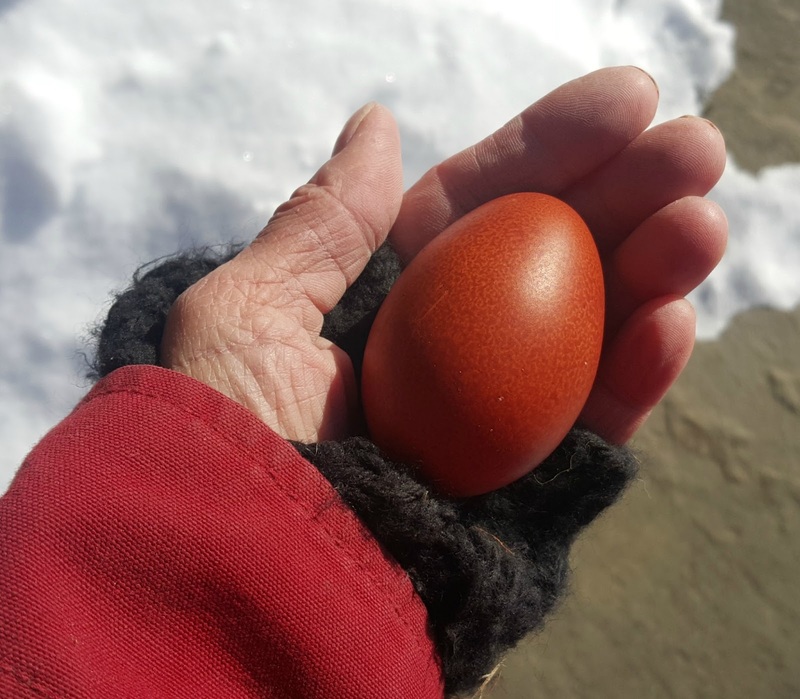 Did you know that the French don't even start to grade the color of a Marans eggs until a pullet has laid a dozen eggs - since the first few eggs can sometimes be a darker color that she won't be able to reproduce again in her laying life? We raise both Blue and Black Copper Marans. I did not know these fascinating facts about Marans. I have Cuckoo Marans though, and find them easy-keepers, very productive, the roosters are mellow, and the eggs look like chocolate Easter eggs. What's not to like about them? I love my Marans. BTW, I am so pleased to find another blog about chickens! 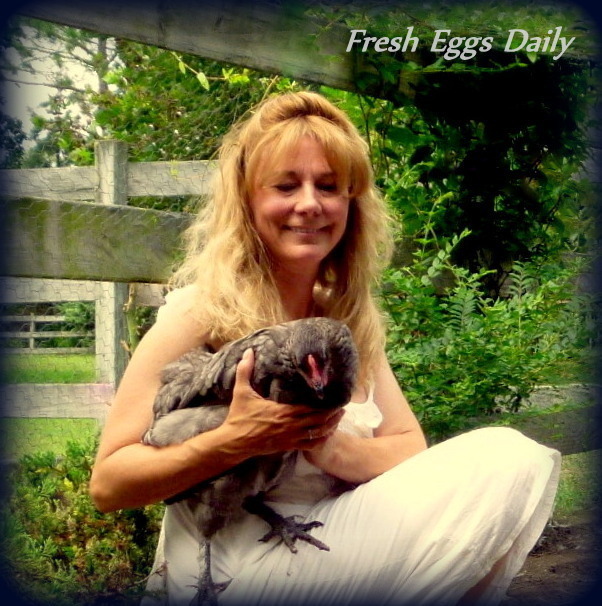 I forgot to let you know I added your blog to my chicken blog sidebar, and added you as a "LIKE" on my facebook page. You have so much practical and helpful info to add to the world of raising poultry.Thank-you. Thanks Kathy ! Much appreciated. I love our Marans also. And you're right the Cuckoo Marans are very low-maintenance, they just do their thing quietly. Very personable hens. I have to admit tho this Blue Copper who just started laying laid a gorgeous egg! Thanks for this information Lisa. I hope to have one these beautiful hens someday! Those are some interesting facts Lisa. Again, thank you for sharing. I am anxious to see (I have 5, 3 month old Cuckoo Marans) when they start to lay their eggs how dark they are. I love a rainbow of eggs. We have been on the search to buy some Marans locally after I read a previous blog post about these lovely chickens. Now, I want some even more! Thanks for the informative post, Lisa. What lovely eggs! I shall be on the look-out as to where to get some of these beauties! I have two Black Copper Marans pullets who are about 3 months old. We have a bit to go before they start laying but they have such lovely temperaments! They are by far the friendliest of my flock. I also have a Black Copper Marans roo who will eat right out of my hand. Such a cool breed. Looking forward to hatching some chicks next spring! Good morning " Fresh Eggs Daily "....Of course all of your chickens are beautiful....I have to say thou out of all the breeds that I have, I have had the most problems with the French Black Copper Marans... but I have grown to love them all the more because of it...Out of a flock of 16, I have already gone thru 3 cases of sour crop, ( I think now I could write a book about sour crop ), problems with the eggs, not being hard shelled enough..and I mean really not hard shelled enough...2 cases of the chicks never growing, the first chick live to be 3 months old, when she died, the second one is now 5 months old, she has grown just a little, but she has problems with her head, she always wants to hold her head back, and sometimes she likes to walk backwards, this could be from a lack of " Thiamin ", which is a vitamin,but she eats and drinks very well...and then we have the cases of the ones with Vitamin deficiencies.....In my case, I have taken it all the way back, to the original eggs, that I hatched out....out of 24 eggs that I bought, I had 17 to hatch, but it was my very first time to hatch any eggs , with many mistakes....Because after doing much research, I do believe that the Health problems that I have had so far have been from the hens that layed those original eggs that I bought and hatched out, it could have been a lack of something in there feed, that they were not getting at the time, are maybe there whole life so far.........It is particularly important that sufficient vitamins are included in the diet of your breeding stock, otherwise the resulting chicks may hatch with curly, misshapen toes, splayed legs or twisted necks and breastbones, ( It is important to note here that similar defects in incubator-hatched birds may be a result of bad incubator ,management )...My Black Copper Marans, have had all of those conditions...so by you knowing this, it may someday save a life of one of your chickens, then I'am glad that I told you about my Marans....I'am not going to give up on them, but I do know more things now, then I did, that can only better there lifes. I'am so sorry, that my reply was so long, It wasnt meant to turn anyone away from getting any black copper marans, they are a beautiful chicken, and would be a great addition to anyones flock...and I would like to thank Lisa for all of her post, they have been so very helpful...thank you. Hi there. Sorry, I enjoyed your post and meant to respond. I agree with your assessment and its a good reminder to only get hatching eggs from a reputable source and be sure your own flock is eating a good diet before hatching your own eggs. I do think Marans require a bit more 'care'. I have heard that from others also. They are beautiful tho, can be friendly and lay gorgeous eggs. I have had problems with BCMs as well. My first had bad crop problems that required daily special care and eventually I had to cull her. I loved her color and her temperament and her eggs and got another couple of pullets to replace her. One of them got the symptoms of Marek's disease at about 8 weeks, though she had been bred for resistance, and the second now has impacted crop. She is ravenous but nothing is going through and she is getting very skinny. I have tried the normal treatment for a hard crop and nothing has worked. It depends how much you want to spend on her .... I took mine into the vet and they gave her fluids, and a shot to stimulate digestion..... it worked perfectly. This was after purging her for a week and feeding coconut oil, water, yogurt oregano and other things that are supposed to help. .. it was expensive though. Thanks for the post, Lisa. I did not know all these things, I just knew I wanted some for my back yard flock. These eggs look unusually dark from what i am used to from my girls? Is the color accurate? These are beautiful!!! Hi Monika. The color is accurate. And yes, the egg we just got from our new pullet is excellent. Marans are bred for the darkest eggs but that color varies widely by breeder and line. My new layers are from the Wade Jeane line - considered the best. In the past I have gotten Cuckoo Marans from My Pet Chicken and been disappointed with the color, and also some Black Marans from a local breeder. Their eggs aren't as dark as I would like either, although about the shade of milk chocolate, so pretty. I LOVE my Marans! Has anyone else noticed that they sound different from other breeds? My girls make a sound that is almost like a "honk", similar to a goose. Mine are not laying yet. I am anxious to see if their eggs are nice and dark or not! 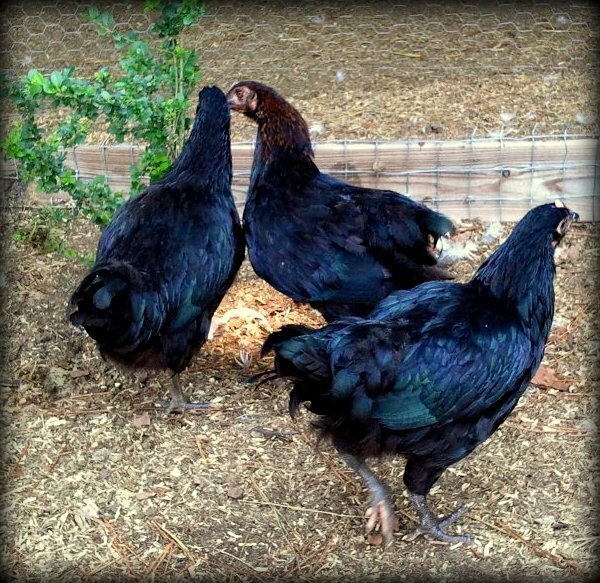 I love my Black Copper Marans....I have had such good luck with them!! Great information Lisa!!! Thank You!!! I have cuckoo Marans, black (nor black copper) and buff orpingtons. Love them - they are about 5 yrs old now and make a lovely flock. I REALLY want to find some blue to add to the flock! Just found your blog - thanks for a great resource ! Welcome! So glad you found us. I love the blues. Chicken Scratch Poultry has beautiful breeds. I bought my Marans because of you and I love them! One of my favorite breeds, now. Thank you for always having such great information! 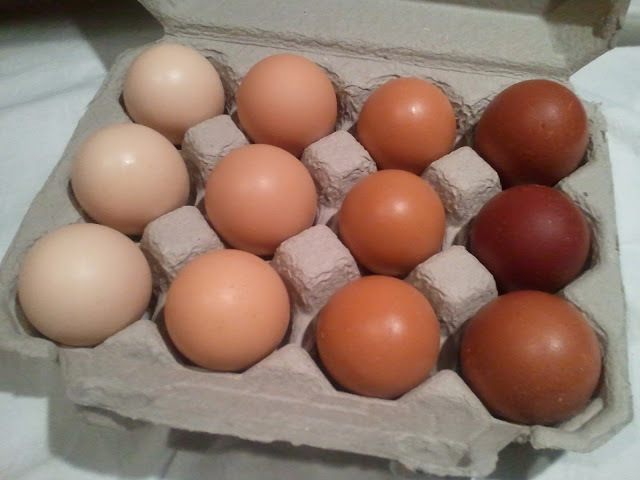 I originally ordered an assortment of brown egg layers and to my complete surprise and joy I was rewarded with Black Copper Marans, a Blue Copper Maran, White Marans, Cuckoo Marans and Welsummers. I love my dark eggs and my chickens are sweethearts. Sometimes you get lucky with assortments and it was fun to watch them grow and try and figure out the different breeds. Very interesting information - both in your post and in the comments! We are planning to start our flock next spring and so I am devouring any information I can get about breeds, coops and free range chickens. Thank you! We had a couple cuckoo marans once. One went broody for months- sat for a month, got for a week, lay an egg and go back being broody. Over and over again. We loved the dark eggs when we got them though! 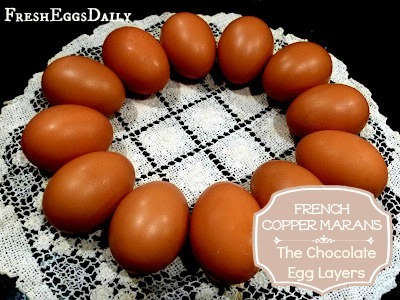 I have one copper marans in my multi-breed flock, but she doesn't lay the dark chocolate brown eggs that I was hoping she would. She's still a sweet hen though.